Is our mind a blank slate when we are born? No, it couldn’t be or we wouldn’t know how to breathe. So our brain and our body know certain things necessary to survive. But what else do we know? There are certain things we seem to just ‘know’. Like someone who sees his first piano and sits down and starts to play. It happens. My son picked up a violin and just started to play at age seven. I was impressed but what do I know? So I brought him to a violin teacher who was equally impressed. As it happens we have a family history full of quite talented fiddle players. Was this genetic memory? If you were a scientist studying genetic memory, you could spend your career studying my son. A friend of mine was sitting watching him one day and turned to me and said, “He’s been here before.” It does seem that way and it is a bit freaky to be honest. But why didn’t I or his sister have all these things he seems to have imprinted on our brains? 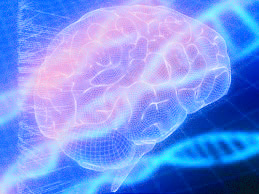 The concept of genetic memory idea has been tested on mice. A first generation group of mice was taught how to find their way through a maze. It took them weeks or months to learn. A year later, the offspring of those mice were put through the same maze. They all found their way through it in half the time their ancestors had. The third generation was even faster and by several generations in–a new generation of mice had been created who knew how to get through that maze in less than 30 seconds without ever having seen it before. They say if you are African American, slavery is part of your genetic memory. If you are Irish, the famine. I suppose that would be the racial memory postulated by Carl Jung. According to him, racial memories are posited memories, feelings and ideas inherited from our ancestors as part of a “collective unconscious”. Whatever that means. I heard someone use the term ‘genetic memory’ today and I just started thinking about it. That’s how my brain works. Earlier today it was dandelions I was thinking about, now genetic memory. This entry was posted on July 28, 2013, in #blogboost, Rants Raves and Reflections, Ultimate Blog Challenge. Bookmark the permalink.